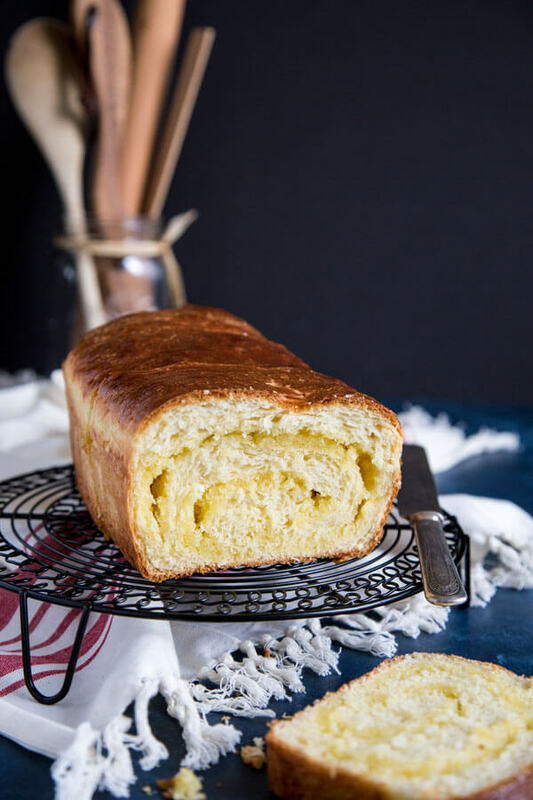 This Coconut Brioche is filled with swirls of sweetened coconut paste inside the fluffiest and softest brioche bread. This is the ultimate weekend brunch or breakfast treat that will sure put a smile on your face. 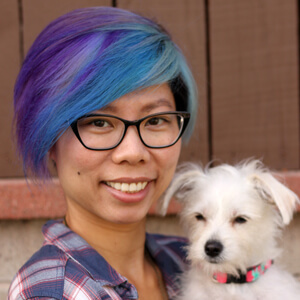 This post has been sponsored by Vital Farms . All thoughts and opinions are my own. 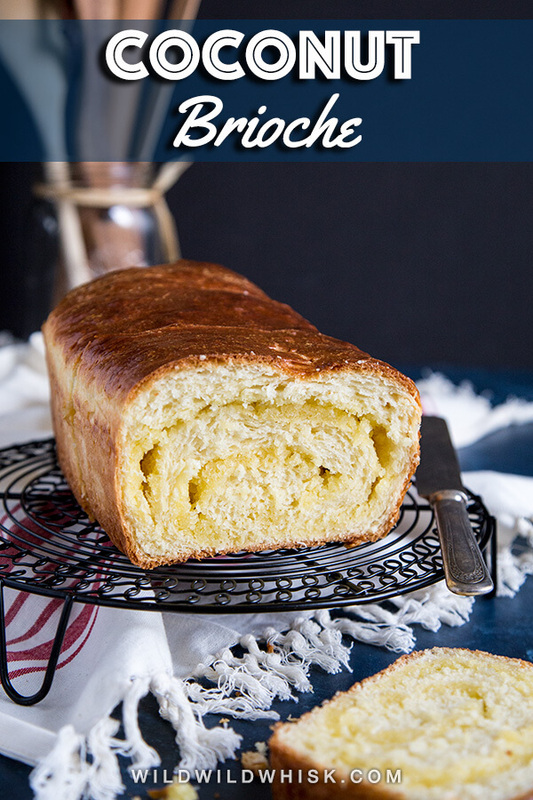 Brioche has got to be one of my favorite bread, it’s rich and tender, and tastes amazing as toast or made into a sandwich. This Coconut Brioche takes it up a notch with a sweetened coconut paste swirl. 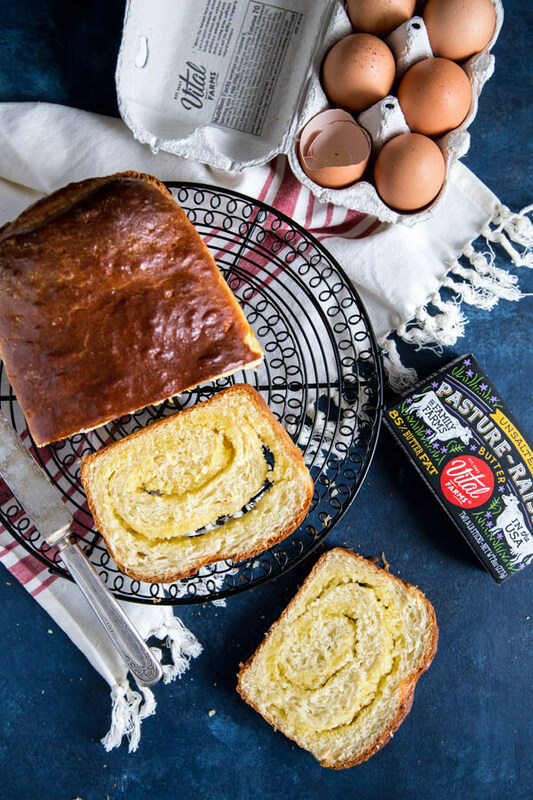 The bread is enriched with both Vital Farms Pasture-Raised Eggs and Vital Farms Pasture-Raised Unsalted Butter. The result is an irresistible treat that’s perfect for brunch or tea time. 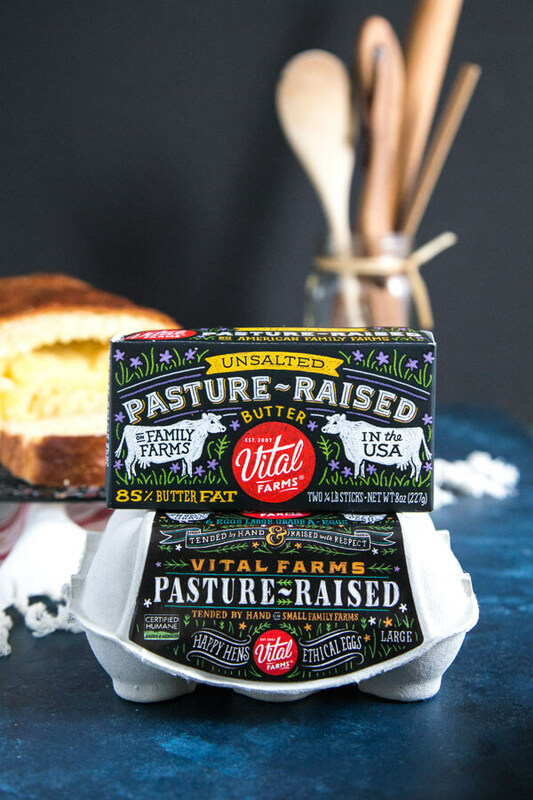 You can find Vital Farms eggs (12 ct.) and butter at your local Albertsons stores. Vital Farms literally started in the founder’s backyard, a really large 27 acre backyard that is. 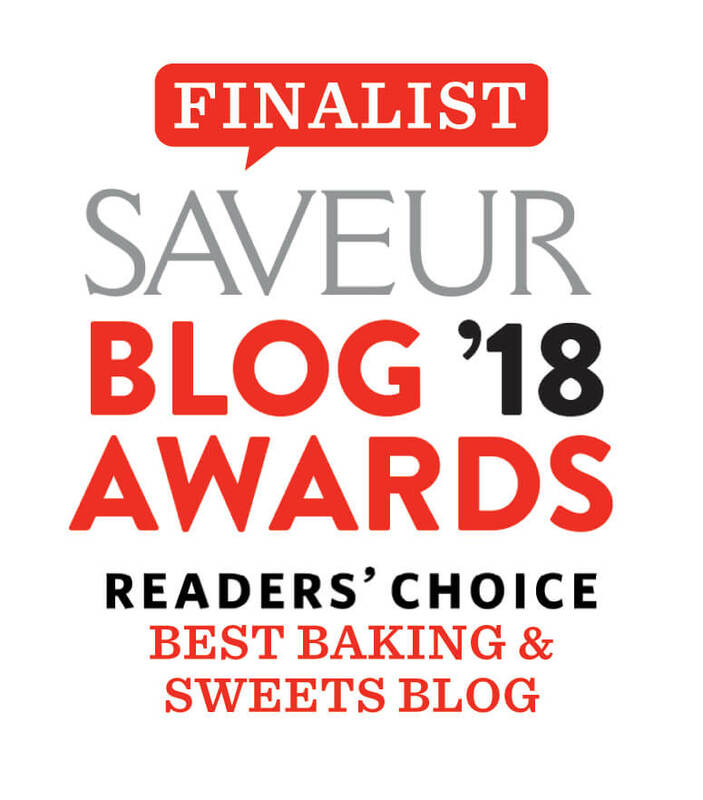 It is a young company with a mission to bring ethically produced food to our tables by working with small family farmers to offer pasture-raised product and setting the national standard for animal welfare. The care they put into their products really shows from inside out with beautiful arts on the packaging that will catch your eyes immediately on the grocery store shelves. 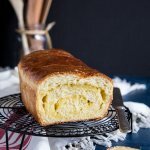 This Coconut Brioche is a simple twist on my Asian Coconut Buns, something I always love picking up when we go shopping at Asian grocery stores or when we stop by our favorite Asian bakery. But the whole loaf is much simpler to make, you just need to shape the bread once! I know homemade bread can sound intimidating sometimes, and then I have to throw in swirls of coconut. But it really is simpler that your mind makes it up to be. First off, lay out all of your ingredients before you start. 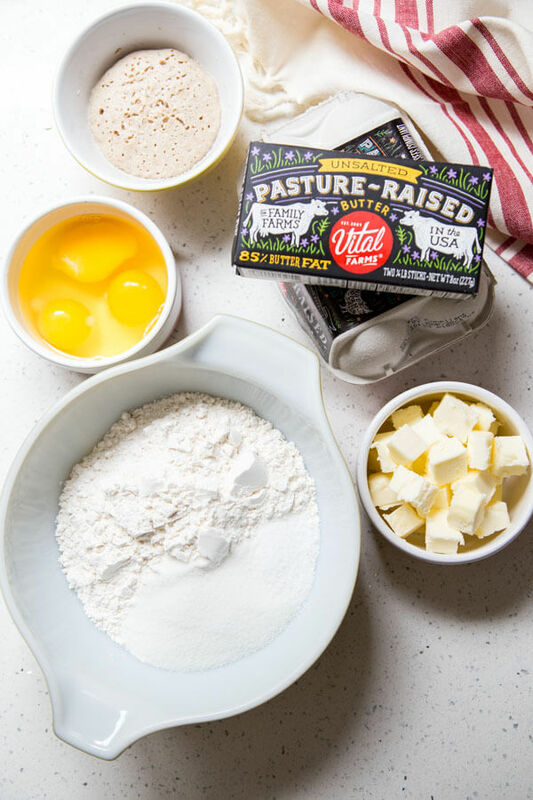 Cut the butter up into small cubes and let all refrigerated ingredients come to room temperature, that’s including the milk, Vital Farms eggs, and butter. Measure out the flour, salt and sugar into a small mixing bowl, stir it with a whisk. When you measure out 1/4 cup of sugar for this, take a teaspoon from it and add to the milk. We will use this to bloom the yeast. Typically, I will warm up the milk to bloom the yeast in, but you don’t have to in this recipe, room temperature milk will work fine. You can see in the above picture how puffy the bloomed yeast looks, this takes about 10-15 minutes. But sometimes, it can take longer; however, if the yeast doesn’t look like it’s doing anything after half an hour, it may be dead and you can try again with a fresh batch of yeast. Always bloom to yeast to ensure it’s working! 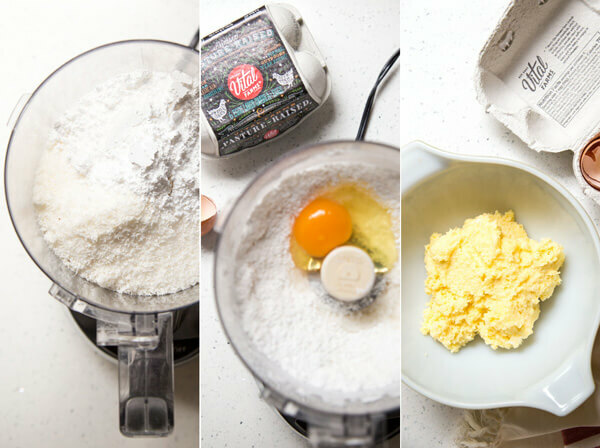 Beat the eggs slightly in the bowl of a stand mixer, then add the bloomed yeast and flour to it. Knead until the dough comes together (about 5 minutes). 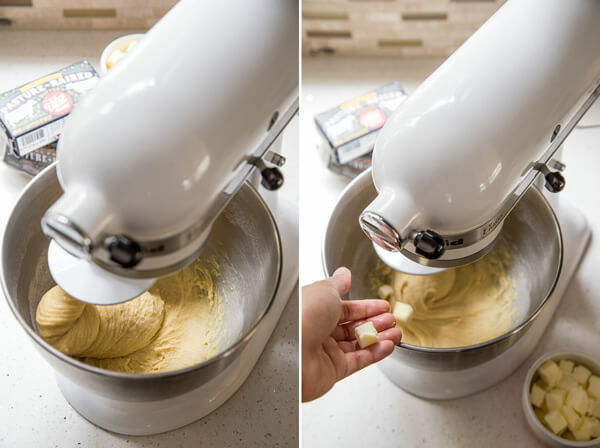 Now add a couple cubes of softened butter to the dough while the machine is kneading, keep adding a couple cubes at a time and allowing it to incorporate into the dough (about 10 – 15 minutes). Continue kneading for a total of 30 minutes. This brioche dough is going to be very soft and shaggy, but together. The best way to handle this dough is to butter your hands really well, that way the dough won’t stick to your hand while you’re shaping it. Also use as much flour on the counter as you need to prevent it from sticking to the counter. Shape the dough into a smooth ball and place it in an oiled glass bowl; let it rise in a warm spot. Sometimes, what I’ll do while waiting for the dough to rise is start a batch of cookies in the oven or prep some meals on the stove top, and keeping the dough real close so the residual heat will help it rise quicker. Once the first rise is complete, make the coconut paste in a food process and roll out the dough into a rectangle. Spread the coconut paste over the dough as evenly as possible. You can use your fingers to break up the paste, use a spatula to smear it. This brioche dough is really soft, so use a light hand while spreading the coconut paste. It does not need to be perfect, but just make sure nothing is in a big chunk, this will weight the dough down during the second rise. Loosely roll your dough into a log. 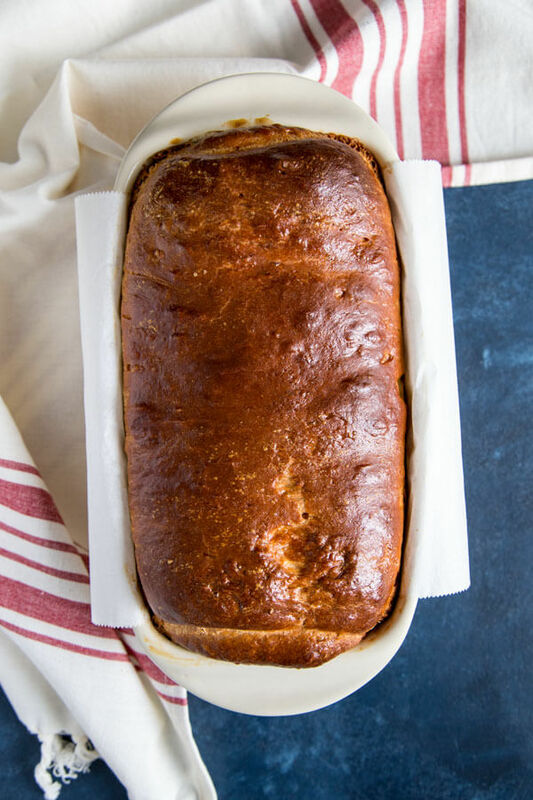 Now, place your coconut brioche in a prepared loaf pan and let it rise again in a warm spot until double in size. Add a layer of egg wash on top and bake until golden brown. Check the bread during the last 10-15 minutes of baking to make sure it’s not browning too much, you can cover it with a piece of foil and continue to bake if it is. Happy hens and contented cows make the best eggs and butter, and I love that Vital Farms make an effort to treat these amazing animals with respect and give them space to roam on green pastures. They allow us to put delicious food on our tables, they more than deserve blue sky and green grass. 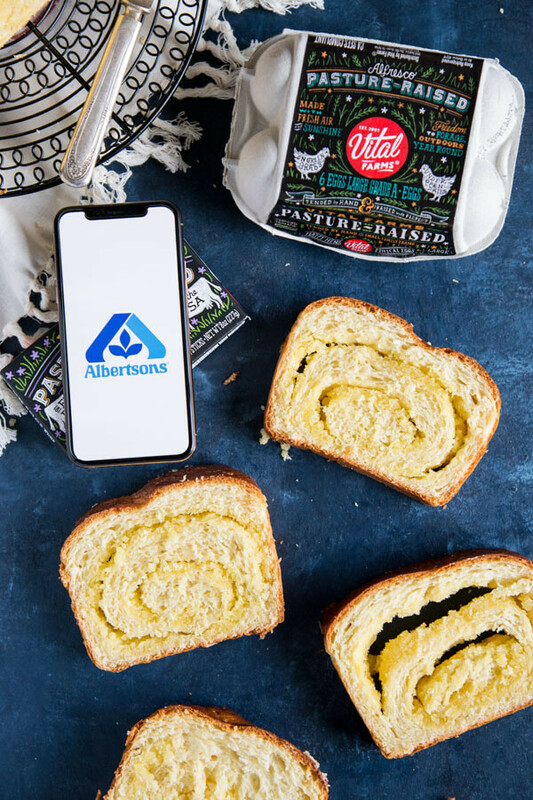 I encourage you to try out Vital Farms eggs and butter, and use the Albertsons’ app to find a coupon! This Coconut Brioche is filled with swirls of sweetened coconut paste inside the fluffiest and softest brioche bread. This is the ultimate weekend brunch or breakfast treat that will sure put a smile on your face. Cut the butter into small cubes, about 1/2”, and allow to soften at room temperature. Let the eggs and milk come to room temperature as well. Add a teaspoon of sugar to the room temperature milk, mix to dissolve. Sprinkle the active dry yeast over the milk and stir to submerge all the yeast. Let it bloom for about 10 - 15 minutes; the mixture should puff up. Meanwhile, add the rest of the sugar, flour and salt in a small bowl and whisk to evenly distribute. In the bowl of your stand mixer, lightly beat the eggs with a hand whisk. Add the bloomed yeast mixture along with the flour mixture to it. Use the dough hook to knead on low speed (speed 2) for 5 minutes until a wet dough comes together. 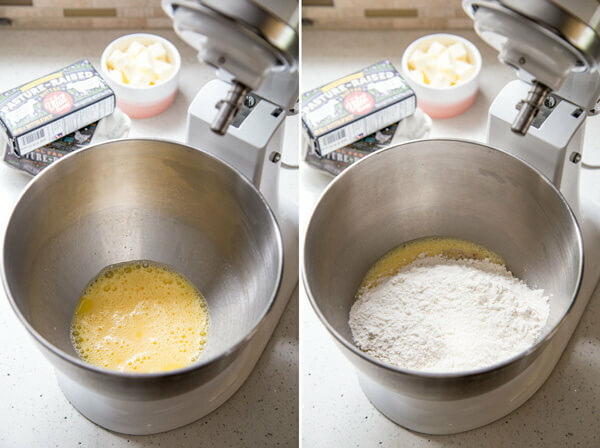 Leave the mixer on speed 2 and add the soften butter, a few pieces at a time, allowing it to combine with the dough before adding more. This will take about 10 - 15 minutes. Then let the mixer knead for another 10 - 15 minutes until all of the butter is completely incorporated. Scrape the dough out onto a floured counter top, sprinkle flour on top of the dough. Rub butter or oil on your hands and knead a few times until smooth and shape the dough into a ball. 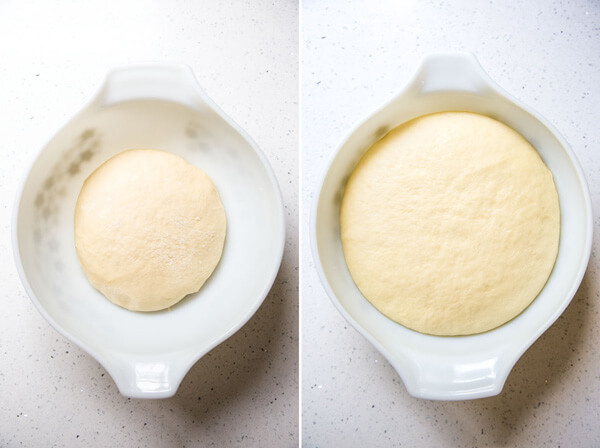 Place dough into an oiled glass bowl and let rise in a warm spot for 1.5 - 2 hour until at least double in size. Add unsweetened coconut and powder sugar in the bowl of a food processor and pulse to mix. Add the egg and 1 tablespoon of coconut oil and pulse until a paste form. Set aside. Scrape the dough out of the bowl onto a floured counted top and punch the air out. 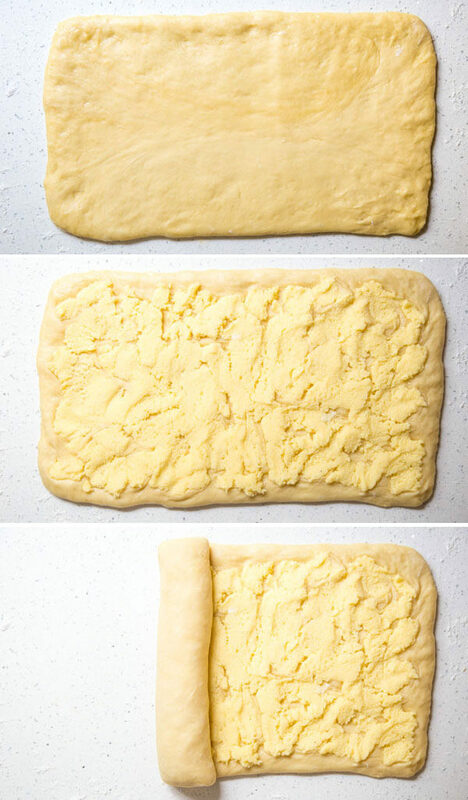 Roll the dough out into a rectangle about 8”x13”. 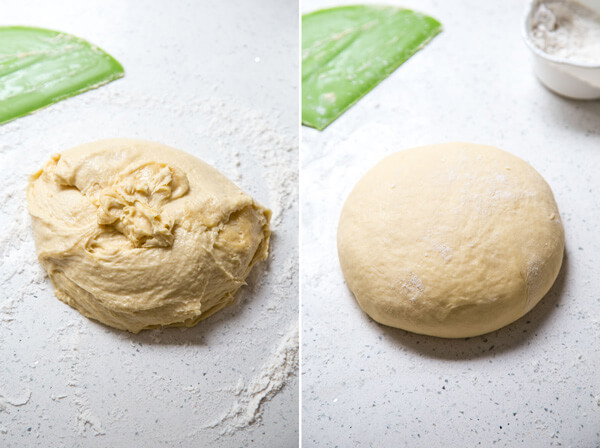 Spread the coconut paste on top of the dough as evenly as possible and roll it up starting from the shorter side. Butter a loaf pan and line it with a strip of parchment paper, butter the parchment paper as well. 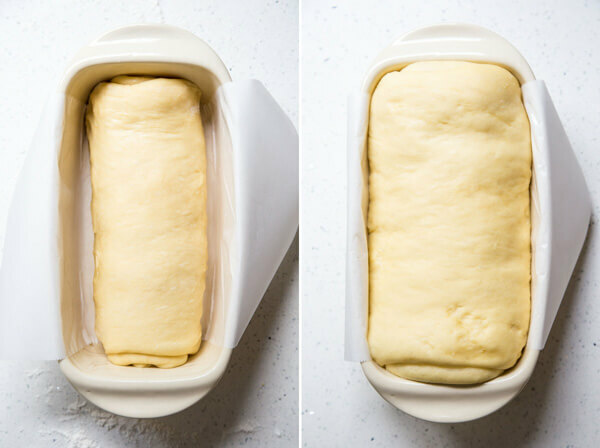 Add the rolled up dough to the loaf pan and let rise in a warm spot for 1.5 - 2 hours until at least double in size. Beat an egg with a tablespoon of water to make egg wash, and brush the top of the dough with egg wash very lightly. Bake in the middle of the oven for 40 minutes. During the last 10 - 15 minutes, if the bread is getting too brown, drape a piece of foil over it to prevent it from burning. Remove it from the oven and let cool on a wire rack. When it is cooled enough to handle, lift it out of the baking pan. To serve, cut into slices with a serrated bread knife. This dough is wetter and shaggier than other bread dough, but that’s okay. Keeping the dough wet will yield softer bread when baked due to the higher water content. The best way to keep the dough from sticking to your hand is to rub your hands with butter or oil before working with the dough. Use extra flour generously while working with the dough on the counter top to prevent it from sticking to the counter top.